Recommended for increased energy, endurance and a stronger immune system. Also recommended for athletes. 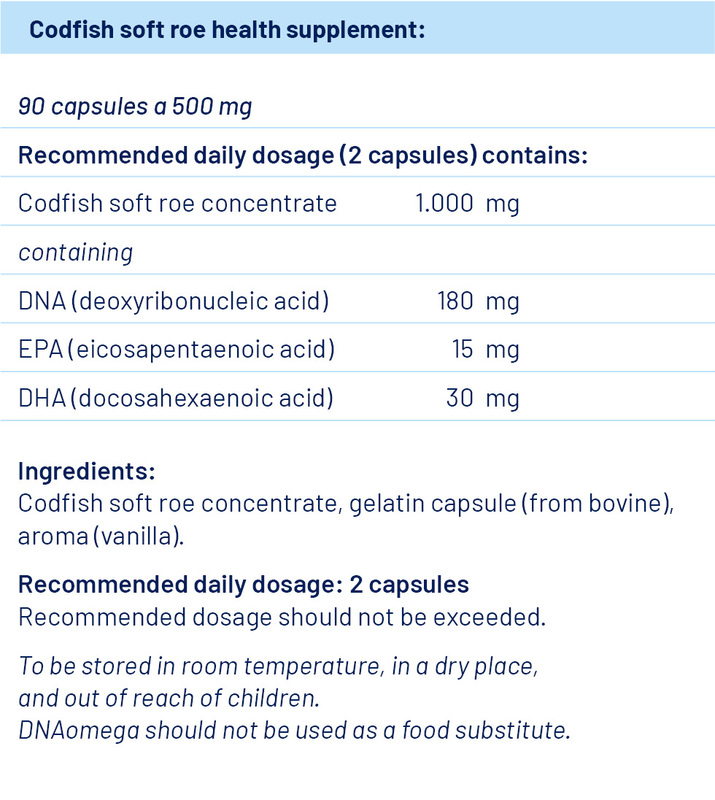 DNAomega consists of 100% fish soft roe and is a natural product with no additives. As early as roman times, fish soft roe was a well known and used product. In more recent years it has been used by fishermen, mine workers and others exposed to pollution or harsh climates, as it gave them strength and robustness. Science has since proven that this is a resultof the 18% DNA content found in soft roe. In addition, it has been found to include phospholipids (Omega-3), Vitamin B, Q-10, minerals and important proteins. The secret lies not only in its contents, but also in the composition of the nutrients. Concentrated DNA (deoxyribonucleic acids) is only found in soft roe. DNA consists of Nucleotides, which are important in the creation of new cells (anti-aging effect), as well as in connections important for energy flow and protein synthesis in our cells. Certain organs are not capable of producing sufficient amounts of nucleotides on their own, in particular the intestines, which are vital for the absorption of nutrients, which in turn protect the body from infections. Nucleotides are therefore important for a well-functioning immune system. Center for International Health, Fiskeridirektoratets Ernæringsinstitutt, and University of Bergen (Norway) worked together on a field study in Ghana, where the results demonstrated DNAomega to be a powerful immune stimulant. Included were 144 children between the ages of 3-5 old, divided into two groups. Both groups received a traditional rice meal with vegetables. A supplement of 10% fish protein powde rwas added to the food in both groups. One of the groups also received 0,5% DNA (equivalent to approx. 2% DNAomega) with their rice. The study lasted 7 weeks, and the general health conditions improved significantly for both groups. However, the group with DNA added to their food had a significant increase in the IgG-level (Immunoglobulin Gamma) in their blood, compared to the other group. The IgG blood marker is generally considered an indicator of the infection fighting capacity of an individual, and the result signifies how DNA can be a powerful immune stimulant.